The RR Program seeks your input on a draft document for use by persons who hire and those that provide services associated with conducting certain environmental response actions in Wisconsin. It identifies the professional qualifications and certifications for performing and supervising work required by Wis. Admin. Code ch. NR 712, and the requirement for certifying specific submittals for actions conducted under Wis. Stat. ch. 292 and Wis. Admin. Code chs. NR 700 – 754. The current version of the rule has been in effect since November 2013 when Wis. Admin. Code § NR 712.03(1) was amended to add the requirement that a “hydrogeologist” also must be licensed as a hydrologist or registered as a geologist with the Wisconsin Department of Safety and Professional Services. 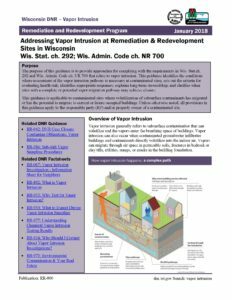 The document can be reviewed at http://dnr.wi.gov/news/input/guidance.html and comments can be submitted through April 4, 2018 to the Brownfields and Outreach Section Chief, Christine Haag at Christine.Haag@wisconsin.gov. In addition, the RR Program will host a question and answer session on the qualification and certification requirements in Wis. Admin. Code ch. NR 712 as part of the NR 700 Technical Focus Group meeting scheduled for March 12, 2018. Meeting logistics and agenda can be found on the NR 700 Technical Focus Group website (dnr.wi.gov search “NR 700 technical focus group”). Please note: Attendees must check-in at the visitors desk on the first floor. A conference call number is also available. Please RSVP to Judy Fassbender if planning to attend, judy.fassbender@wisconsin.gov.